Magic Lantern Show: The Sensual Pleasures of "The Third Man"
I read an interview years ago with Pedro Almodovar in which he said that when a film is really working, it seems to be dancing across the screen. "The Third Man" is a great dancer. Directed by Carol Reed ("The Key," "Oliver!") and scripted by Graham Greene from his novella, the movie works as a dark comedy about corruption, a portrait of ruined postwar Vienna and a peek into the fathomless depths of the human personality. But when you think about it later, you don't recall those aspects first. You think about the way it sounds and moves—the look and feel and rhythm of it, the way it shimmies and glides. It is, to borrow a phrase from the script, a magic lantern show, set to music. The zither score, by Anton Karas, is a masterstroke, because it centers every scene, regardless of its emotional temperature, within a wry and knowing acceptance of how hard life can be—and how tough, philosophical and willing to take a joke you'll need to be if you're to have any hope of getting through it. It's the musical equivalent of the serenely smug yet irresistible grin on black marketeer Harry Lime's face when it's revealed by light from an upstairs window. The movie's hero, western writer Holly Martins (Joseph Cotten), is eventually shocked by what he learns about his old friend Harry, who seemingly expired right just he arrived in Vienna but actually faked his death. Harry isn't shocked by anything, though; nor are any of the supporting characters, or the film itself. "The Third Man" has been restored at 4K resolution by Rialto Pictures, for digital projection. The result is mostly agreeable, and certainly a step up from watching a badly battered old print of a type that grows increasingly scratchy and inaudible in the run-up to reel-changes. There's a trade-off, as is often the case with digital. The 4K "print" I saw lacked the beguiling mix of sharpness and softness that makes the best-quality celluloid projection so pleasurable.There were places where the movie looked too pristine and crisp, and other places where the evident film grain (a part of the movie, which was shot on 35mm after all) looked too much like digital "noise." But there are compensations. You can see all relevant details in well-lit areas, but not in the deepest, darkest shadows, which honors Reed and cinematographer Robert Krasker's high-contrast visual scheme. This is a movie that respects the impenetrability of darkness, and communicates that respect though composition and lighting. It would have been a sin to try to "correct" all that, and this restoration team hasn't. And the sound mix is perfect—gentle and dreamy during quiet sequences, and joltingly loud but not overbearing in scenes that involve police whistles, gunshots, underground waterfalls, and footfalls on cobblestones. It is a suitably overwhelming aesthetic experience, a fugue state with jokes. Joseph Cotten, still one of the most under-appreciated leading men, gives one of his career-best performances as Holly, communicating the character's peevishness and disappointment and intransigence but also his idealism and guile. There is not one second where you catch him acting. I briefly toyed with trying to keep Orson Welles' presence in this film a secret here, because I did the same thing back in college before showing the film to a girlfriend who'd never seen it before and didn't know anything about the plot or cast, and it increased her delight at that reveal of Lime in the doorway with a kitten nuzzling his wingtip shoe. (Walker Percy cited the Harry Lime reveal in his novel "The Moviegoer," as a moment that felt more real to to the book's movie-crazed hero than some moments in his actual life.) But what would be the point of a spoiler-averse bit of gamesmanship at this date? Welles' name is on the poster and in the film's opening credits, and his sensibility seems to have informed the movie's Expressionist shadows and tilted angles. Plus, Reed and Greene don't try terribly hard to convince us that Harry really got hit by a truck in front of his Vienna apartment building, as the official cover-up narrative claims. In fact there are shots of distant figures that we feel sure are Harry, or at the very least someone who knows Harry, and the character manages to be an absent presence all through the story, probably because every important conversation is about him. The inevitability of Lime's reappearance becomes part of the movie's intimate, shared awareness of how deceptive people can be, as well as a comment on how, in life, we may occasionally feel as though we're wandering through a conspiracy, and can discern only the outlines, not the details. And in the end, the details of Harry's disappearance, as well as his ongoing scheme to get rich selling diluted black-market penicillin, are of secondary significance to the movie's riches, even though "The Third Man" never loses track of what it's trying to say about nations and people. I've seen it many times, and each time I notice new things, some related to the film's place in movie history, others more fleeting and self-contained, like discovering a clever background detail in a painting you only thought you'd absorbed. The editing, by Oswald Hafenrichter, is fascinating for how it splits the difference between continuous "real time" action and time-compressing montage editing. There are cuts in the film that feel like harbingers of the celebrated jump-cuts that Jean-Luc Godard would popularize in "Breathless." Lime's actress girlfriend Anna Schmidt (Alida Valli) appears in an apartment doorway while Holly is seated, and he gets up, and the film cuts back to her and then to him, and suddenly he's standing in a different part of the room. Continuous music smooths over the visual disruption, just as it will do in the film's first foot chase, which fractures geography and time in a way that makes it feel almost like an expository montage, or a recollection of a chase after the fact. This editing may, of course, be a logical outgrowth of the movie's economical storytelling, which gets into scenes later and out of them earlier than almost any great film I can recall. There are scenes, particularly in the opening section, that last 30 seconds, or fifteen, and consist of a few lines and an exchange of looks. Throughout, there are grace notes that remind us that even in a place as dire as the Vienna of "The Third Man," it is still possible to be humane: I love how one of the cops gives Anna her lipstick as they're taking her away. Also notable is the film's barbed-wire postwar belief that people cross all sorts of lines in a war zone (or a post-war zone), and they have to go far beyond the pale, as Lime does, before they can be written off as irredeemable. 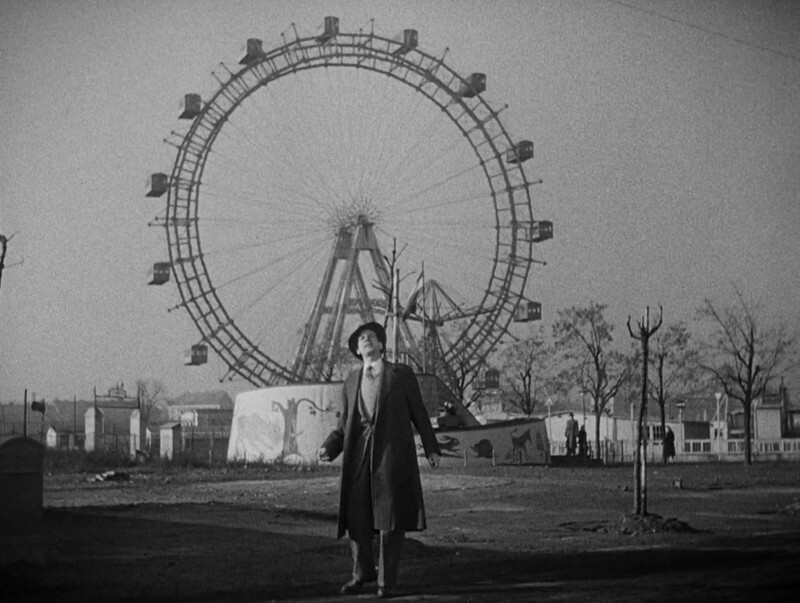 Each time I see the film, Lime's speech at the base of the Ferris wheel about Italy under the Borgias versus the pleasant tedium of Switzerland sounds less like an antihero's charming self-justification and more like a hollow excuse (though I never cease to be amazed at how much life Welles' packs into his handful of scenes). The scene where Trevor Howard's police inspector leads Holly on a tour of the pediatric ward, and we sense the horror of what's in those cribs by staring at Cotten's face, is a definitive refutation of anything Harry might say in his own defense. The movie can't forgive Harry, and Greene, who knew what people are capable of, gives us permission not to, either. It's a very post-World War II attitude, this idea that one can understand evil and try to feel empathy for people who succumb to evil while still punishing them for doing unforgivable things. The final shot gets this across, too, in its muted way. It's as voluptuously beautiful as a closing shot can be while still being funny. Holly gets out of the car and waits for Anna, who's walking down a long road through a grove of trees. Viewers primed by Hollywood (Holly-wood!) endings may expect that this tale, too, will end with the hero getting the girl, even though in this case the hero used the girl as bait and got her boyfriend killed. But no. She walks on by, and Holly lights a cigarette, because what else can you do? The Unloved, Part 19: "The Assassination of Jesse James by the Coward Robert Ford"